Hangar 8 (building 443) can be seen here. It is quite a large building, used by Northrop. This hangar may have housed the B-2A Spirit Stealth Bomber during testing at Area 51. 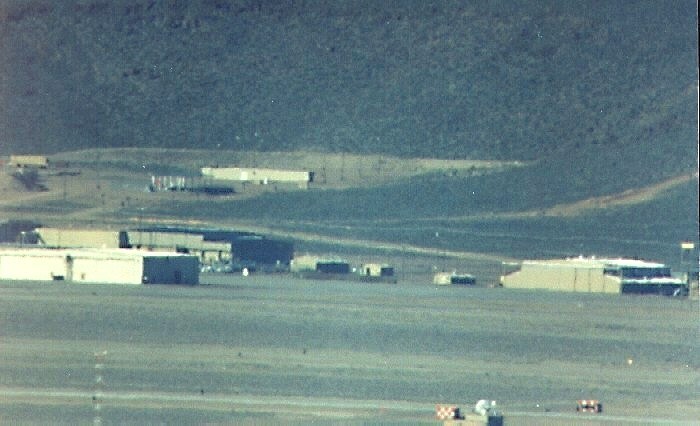 To the left of H-8 is the Hangar 8 Storage Building (Building 445). The large hangar left of 476 is the rear part of Hangar 17. The adjoining building is the front part of Hangar 17. The long low building in the background is Building 555, the Pistol Range shed. The cleared area behind it is where the targets are.